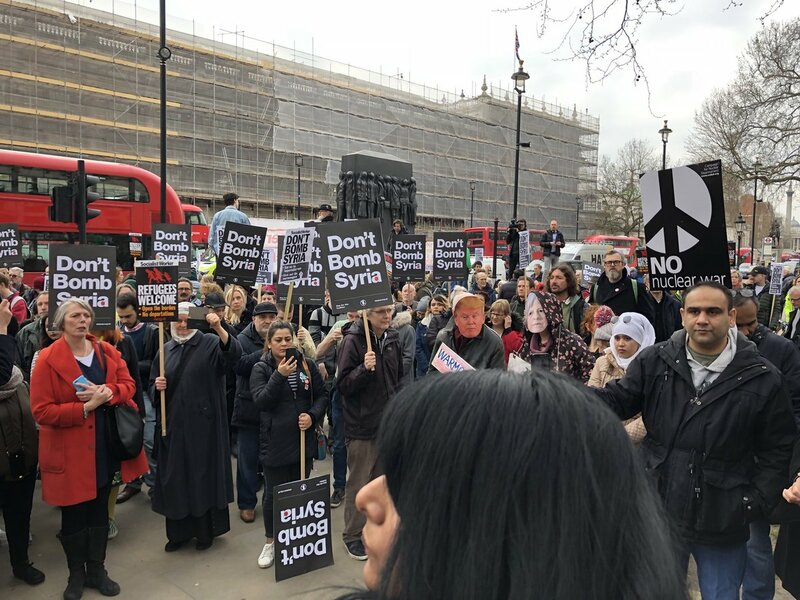 "The response to the strikes by Trump, Macron and May on Syria has been remarkable, with protests, vigils, lobbies and rallies across the country and a social media storm against the attack. We have received information about emergency protests which took place in over 40 towns and cities all across the country, including in Aberdeen, Aberystwyth, Bangor, Birmingham, Bournemouth, Bristol, Cardiff, Chester, Doncaster, Edinburgh, Exeter, Hull, Isle of Wight, Leeds, Leicester, Liverpool, Milton Keynes, Minehead, Manchester, Norwich, Newcastle, Nottingham, Orkney, Plymouth, Sheffield, Southampton, Swansea and Wolverhampton. 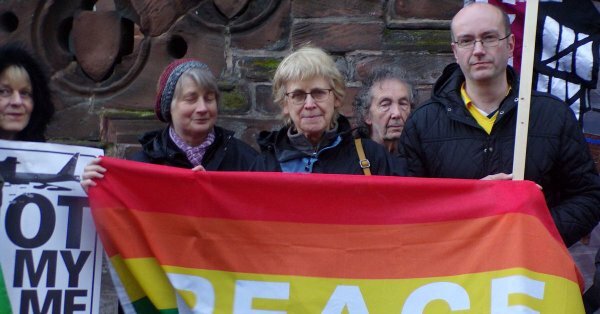 "Hundreds of people attended Saturday's protest in Liverpool, at which a number of speakers, including Dan Carden MP, Merseyside Stop the War convenor Geraldine O'Connell as well as writer Alan Gibbons, spoke against the attack. Hundreds marched against the war through the centre of Liverpool." 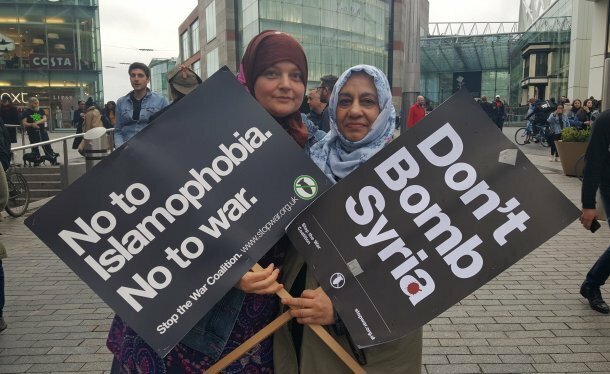 Other actions that are reported: a vigil for Syria on April 21 in Warrington; a Manchester protest April 16 at Piccadilly Gardens; a public meeting on April 17 at the Central Hall in Oldham Street. 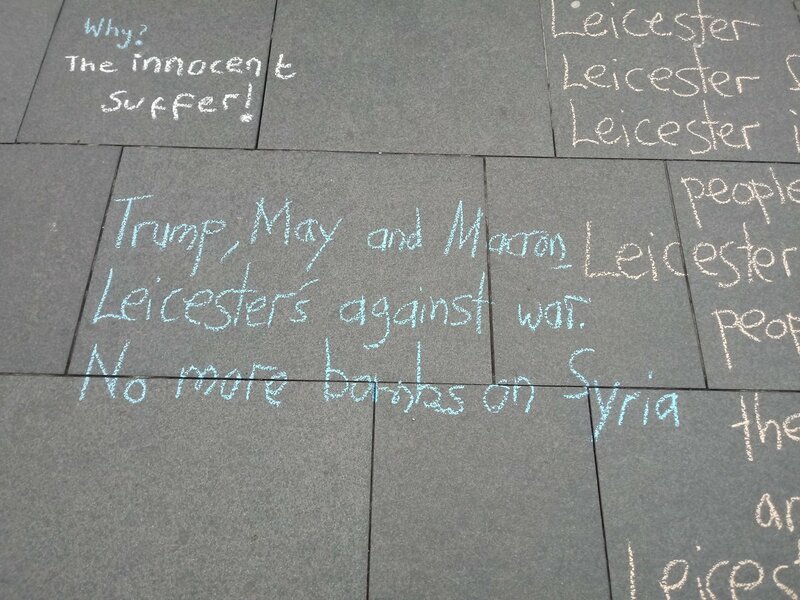 Sizeable protests also took place in Birmingham and in neighbouring Wolverhampton, where a new Stop the War group is now being formed. Close to a thousand people came to the Bristol protests. In Leeds, two protests were organised, one on Friday and one on Monday. Scores of people also came out to protest outside The Forum in Norwich. "Vigils and protests happened across Wales as well, from Aberystwyth in the South through Cardiff to Bangor in North Wales. 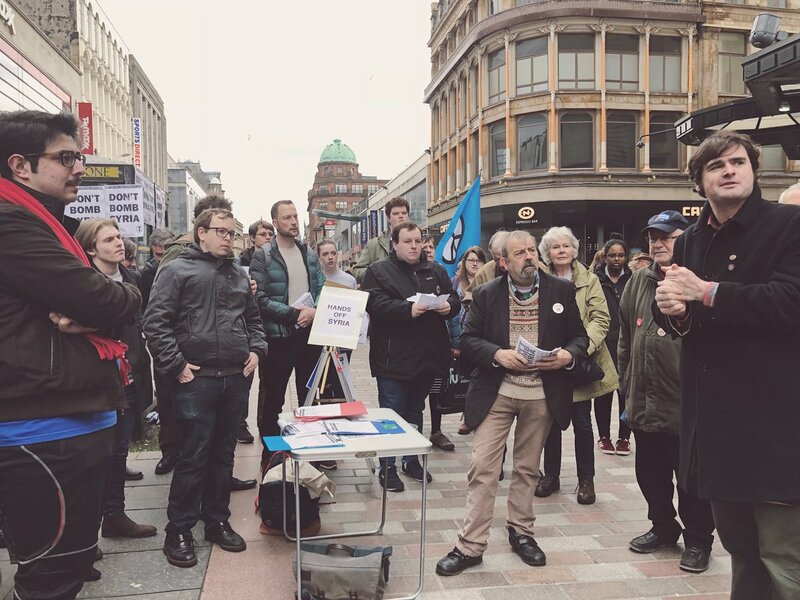 In Scotland, protests, vigils and other anti-war activities took place in Edinburgh, Dundee, Aberdeen, and even on Orkney. "In London, around 500 people attended an emergency protest on Friday at Downing Street. 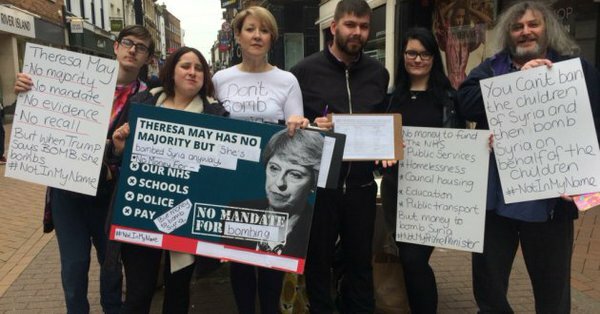 A letter opposing intervention and signed by numerous trade unionists, MPs, celebrities and academics was then also handed-in to Downing Street. 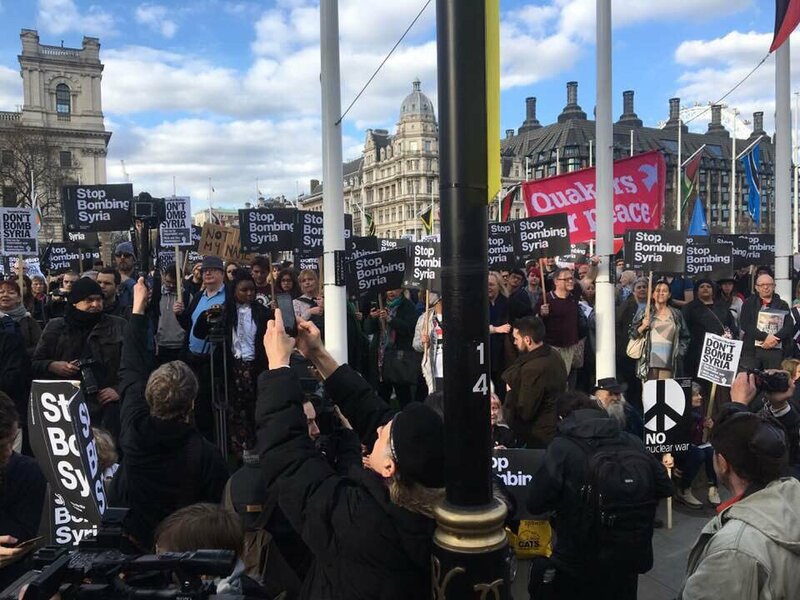 On Monday, a couple thousand people rallied in Parliament Square to hear anti-war speeches and express their concern at the recent actions of the British government." 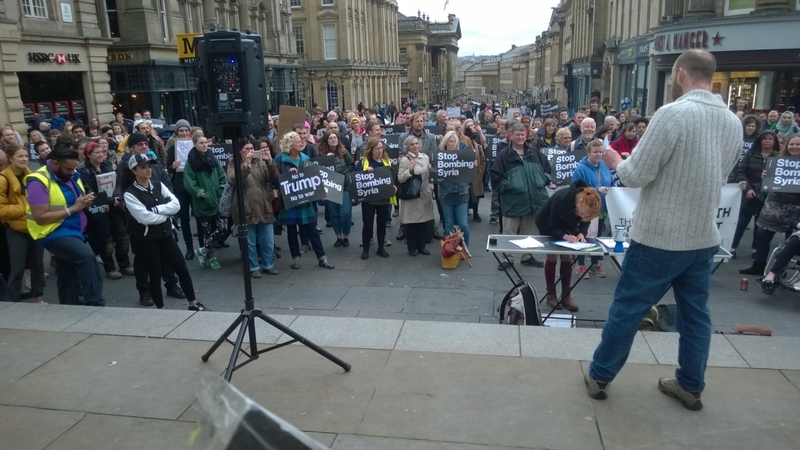 On April 17, over 200 people attended a Newcastle Stop the War Coalition protest at the Monument, Newcastle to condemn Trump, May and Macron's bombing of Syria and call for no more bombings. The protest was chaired by Tony Dowling and speakers were Conor McArdle - Unison, Ann Schofield - Newcastle city councillor, Jamie Driscoll - Northern Regional Organiser, Momentum, Mollie Brown - North East People's Assembly Against Austerity, Pam Wortley - Sunderland Stop the War and Roger Nettleship - convener, Newcastle Stop the War. Finally Ron Brown - a singer-songwriter sang for the protest, "Newcastle Stand Up To Trump." Speaking at the event Newcastle Stop the War said that: "we say today to Trump, May and Macron as we said to Bush and Blair this is 'Not in our Name'. 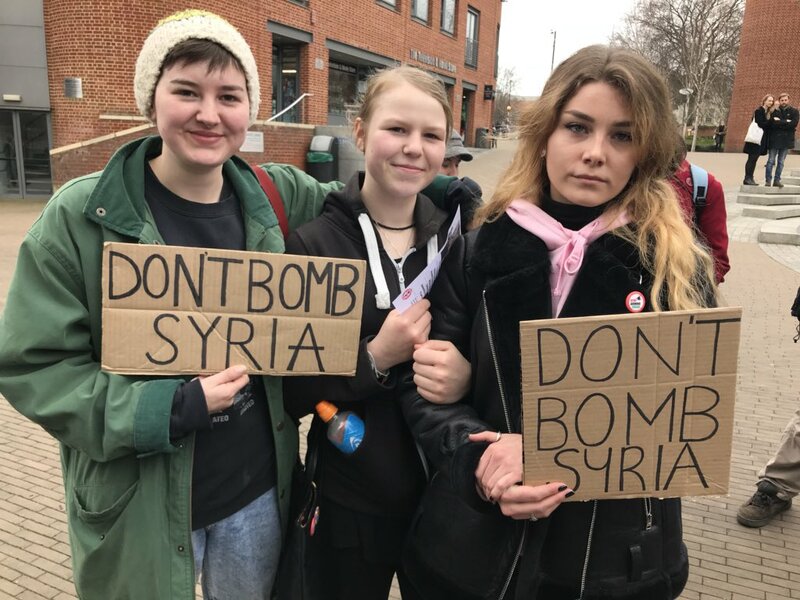 That's why we need to build our Stop the War committees here in Newcastle and the North East with the necessity to fight for an anti-war government in Britain." 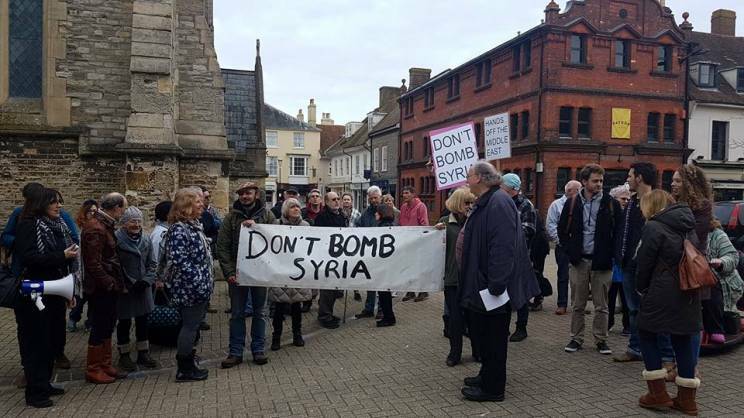 On March 16, people gathered in St Thomas Square, Newport, Isle of Wight, with a banner explicitly demanding, "Don't Bomb Syria!". Speeches were made, slogans such as "Not in our name" were shouted and placards held. A number of speeches denounced the government of Theresa May. A unanimous vote was taken to endorse the proposal immediately to form a local Stop the War committee. The first meeting will take place at Quay Arts next Wednesday at 7.30pm. 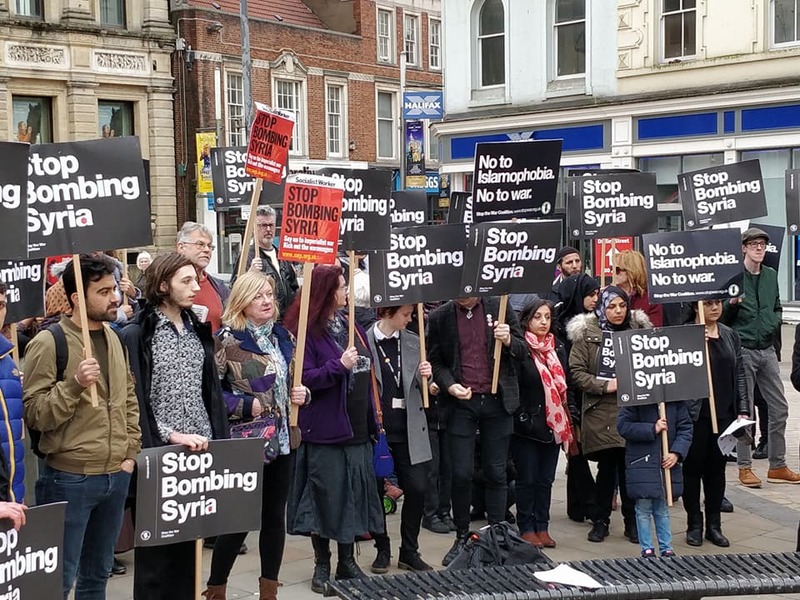 The Stop the War Coalition is calling for a "Not in out name - stop the rush to war" day of action this Saturday 21 April and are asking all our groups and supporters to set up and join activities against further bombing and foreign intervention: town centre protests and speakouts, die-ins, rallies, teach-ins, street petitioning, etc.